Armand Deutsch became a producer on a lark in the late 1940s, on the invitation of a man named Dore Schary. The first picture he worked on was as assistant overseeing production for Schary on "Mr. Blanding Builds His Dream House", starring another past client of ISA, Cary Grant. Ardie (as he was called by friends) and his wife Harriet, had a close friendship with Nancy and Ronald Reagan. The Deutsches became members of the film community as well as the socially elite group of Los Angeles and New York. They lived in a rambling one story house off Beverly Drive in Beverly Hills. Mr. Deutsch's mother was the daughter of the legendary Julius Rosenwald, chairman of Sears Roebuck. His father was the son of a steel executive. It was to be a childhood right out of F. Scott Fitzgerald. His Grandfather's fortune allowed him a life of prominence without work, yet he chose to work. He had the unusual position of being independently wealthy as a scion of a famous family and grandson of a great American businessman and philanthropist, and a mother who also had a distinguished reputation as a philanthropist and supporter of President Franklin D. Roosevelt. 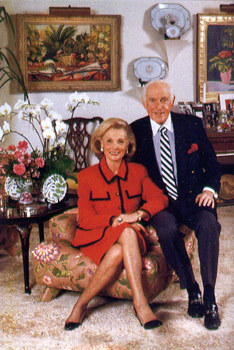 Harriet Deutsch was a major patron of the Los Angeles Music Center with her husband, among the first members of the Blue Ribbon 400 (now called the Blue Ribbon of the Music Center), a group that raises money to support the centers arts and educational programs. The Deutsch household was maintained on a formal East Coast style we took care of staffing for many years, dealing with their prominent social and philanthropic needs.